It’s well known that keyboards, mice and other pointing devices are impractical in certain environments. They are fragile, vulnerable to abuse, susceptible to liquid and dust contamination, and contribute to repetitive-motion injuries. In 1977, we created the world’s first touch responsive industrial terminal, the VuePoint™. It didn’t have a true touch screen; rather, the VuePoint was equipped with a circuit board onto which infrared LEDs were mounted. The LEDs were arranged to form a 12 x 40 grid and when the screen was touched, the infrared beams were broken, indicating the touch location to the terminal. Thus, an operator could control a system right at the terminal. As touch screen technology evolved (along with monitor technology), we incorporated various touch panels into our LCD monitors, starting with our SlimLine™ series of flip-up LCD monitors. Over time and based on demand, our Saber RackMount, PanelMount and Standalone Series became the next logical candidates for touch integration. This was due to increased use of flat panel technology in human-machine interface applications. Today, we offer several types of touch technology on all but a few of our LCD monitors. Though it’s continually improved upon, the technology that goes into resistive touch screens goes back many years, making it the “tried-and-true” and economic choice. They feature a glass panel with a uniform resistive coating, and a thick polyester conductive (on one side) coversheet separated by small, transparent insulating dots. When the screen is pressed with a finger or stylus, the conductive coating makes electrical contact with the coating on the glass, thus registering a touch. Resistive touch screens are extremely resilient to wear and tear, making them a good choice for high-traffic applications. 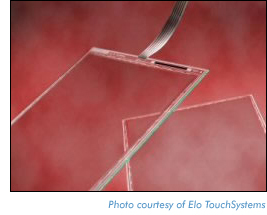 Featuring pure glass construction, Surface Acoustic Wave (SAW) touch screens will almost never physically “wear out” due to a superior scratch-resistant coating. Excellent light transmission ensures that the image clarity of the display remains sharp and vibrant. The stable, “drift-free” operation means that the touch response is always accurate. They work well with a finger, gloved hand or a soft stylus. And SAW touch screens have a sensitive touch response—they recognize the touch location and the amount of pressure applied. Being an all-glass design, light transmission of surface capacitive touch screens is improved, when compared to resistive touch screens. This improves display viewability and reduces eye fatigue. Featuring a scratch-resistant top coat, durability in heavy-use environments is easily maintained. This type of touch screen is ideally suited for rugged, industrial or military applications. Infrared touch technology doesn’t rely on an overlay or a substrate to register a touch, so it cannot physically “wear out,” thus ensuring a long product life cycle. Possessing superior optical performance and excellent gasket-sealing properties, an infrared touch screen is ideal for harsh industrial environments and outdoor kiosks. They work with a finger, gloved hand, stylus, and most any object wider than 1/10". They adjust to changing light conditions, even direct sunlight. And they benefit from stable, no-drift calibration performance. Working in tandem, two optical sensors track the movement of an object close to the surface by detecting the interruption of the touch screen’s infrared light source, which is emitted in a plane across the display surface and can be either active (infrared LED) or passive (special reflective surfaces). 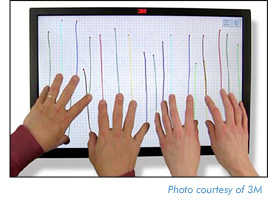 Optical touch screens use a controller board that receives signals from the optical sensors, then compensates for optical distortions and triangulates the position of the touching object with extreme accuracy. The infrared light source and optical sensors of the touch screen are synchronized using a sophisticated algorithm that also reduces the effect of ambient light, thus creating a very clear, accurate touch selection. Developed specifically for interactive digital signage applications, Dispersive Signal Technology determines a touch point by measuring the mechanical energy (bending waves) within a substrate created by the pressure of a finger or stylus. As these bending waves radiate away from the touch location, the signal spreads out over time due to the phenomena of dispersion. The “smeared” signals are then interpreted by a complex set of algorithms to precisely pinpoint the exact touch location on the screen. DST is a passive technology, waiting for a signal created by a touch impact. Therefore, contaminants such as dirt, grease, and other solids can accumulate on the surface and edges of the display screen without significantly affecting touch responsiveness. In addition, surface damage, such as scratches, has no significant impact on touch performance. The sophisticated and optimized controller that continuously monitors for a touch impact is the fastest and most responsive technology available for large format displays, offering greater than 99% touch location accuracy. General Digital is an authorized DST integrator. Our engineers possess the expertise to seamlessly integrate DST technology into your large format monitor, ensuring a reliable interaction with the end-user. General Digital’s Sales Engineers are quite knowledgeable at determining what will best suit your particular application. Contact us at 800.952.2535 today and we will be happy to take the time to understand your needs and make our recommendations.